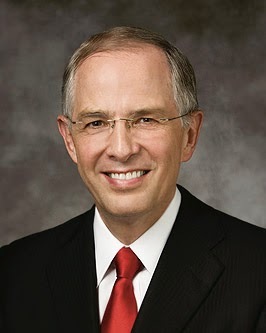 This excerpt is from the talk he gave shortly after being sustained to the Quorum of Twelve. "I know that I am not what I must become. I pray that I might be willing and moldable to the Lord's tutoring and correction. I take comfort from the words of President Monson last night in the priesthood session that the Lord will shape the back to fit the burden placed upon it. "Above all, we proclaim our Savior and Redeemer, Jesus Christ. All that we are—all that we will ever be—we owe to Him. While we gaze in awe at His majesty, He does not ask us to stay our distance but bids us to come unto Him. 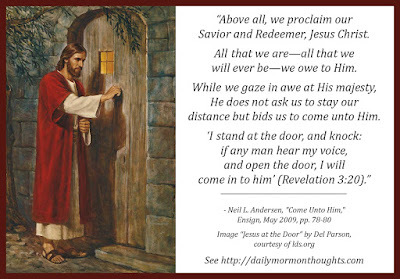 'I stand at the door, and knock: if any man hear my voice, and open the door, I will come in to him' (Revelation 3:20)." As a newly-sustained apostle, Elder Andersen was justifiably overwhelmed at this setting, knowing how the rest of his life would be impacted by what was taking place. But recognizing his own inadequacy, he prayed to be "willing and moldable to the Lord's tutoring and correction." That's a marvelous attitude. The word "moldable" is very descriptive; we should be willing to be changed and transformed into the image that God would see fit for us. A beautiful scriptural phrase for this attitude is "easy to be entreated" (Alma 7:23). The personal anecdote Elder Andersen shares of his exchange with President Packer is a good reminder of the need for humility and perspective. Truly, each of us is a "nobody" in the sense that we are only a servant in God's great work. If we get caught up in our own supposed strength and achievements, we have forgotten where the power really comes from. And this is a great key. The Lord never wants us to feel alone or deserted. He is always willing and eager to bless and sustain us, to work through us to accomplish His work. We need only be willing to come to Him, to open the door to Him and allow that miracle to happen.